15. Cue ball aiming point. It's nearly unanimous: You should contact the cue ball a hair to a full tip below center. 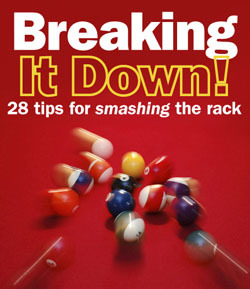 The point is to squat the cue ball at the middle of the table once it hits the head ball. The backspin that you're applying will dissipate after the collision, leaving the cue ball with no locomotion. But be careful: A lot of folks aim low, but their cues creep up on the break stroke. 16. Backswing. "I've always had problems with my break,' says Jeanette Lee. "There are many different techniques that people use, but the universal commonality between them is the slow backswing. On your last stroke, pull the cue back in a controlled motion, and then start forward smoothly and accelerate.' Think of it as pulling back the string of a bow before launching an arrow. 18. Weight transfer and kick. Many of the biggest breakers propel their hips and torsos forward as they're starting their stroke, usually ending in a kick from the back foot (see photo of Jeff DeLuna below). Their weight ends up on the front foot. "You're using your legs to give your arm and stroke more speed and momentum,' says Charlie Williams. "Try to focus on using your back leg to generate forward power. And that makes your back leg naturally kick higher.' One tip to try out: Think of it as a martial arts move, kicking someone who's standing right in back of you. 19. Timing. It's the key ingredient and the most mysterious element of a successful break. In essence, you're trying to get several body parts to work together in a movement that takes less than a second. In the end, go with what works for you. But, in a nutshell, here is the progression that most experts suggest: Finish your backswing, pause, start pushing your hips and torso forward, start a smooth acceleration of the cue, strike the cue ball and then follow-through as your back foot leaves the floor. 20. Cue position at contact. Ideally, at the moment your cue tip hits the cue ball, you want your forearm to be perpendicular (at a 90-degree angle) to your cue. "You're in the middle of the range of motion,' says Shawn Putnam. "You've started accelerating, but you're not running out of stroke yet.' And keep the cue as level as you are comfortable; too much pitch, and the cue ball could jump off the table. 21. Follow-through. After initially hitting the cue ball, the cue should keep moving forward. 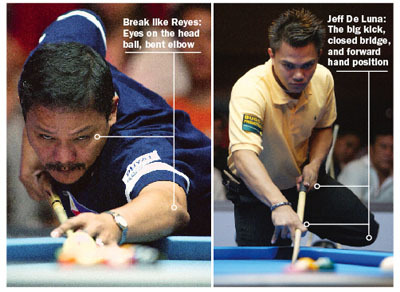 Since the cue is descending into the shot at a short angle, it's only natural that the cue tip should hit the cloth after the point of contact and continue sliding uptable. 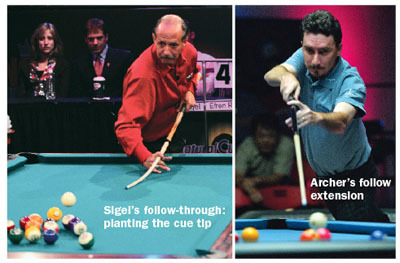 Some players, such as Mike Sigel and Thorsten Hohmann, actually plant their cue sticks at the end of the follow-through, and you can see the shaft bending at the end of the stroke. The guys with the most exaggerated follow-throughs, such as Johnny Archer and Francisco Bustamante, travel past that point until their cues are aloft and frozen in a sort of "Hustler'-meets-Heisman pose (see photos below). Famously, Archer once fouled in tournament play when his cue tip struck the head ball on the follow-through. And that was a good sign. It meant that his aim was right on track. A long follow-through will either improve your accuracy because it's forcing you to stay on line longer, or it will immediately tell you which side of the target you're favoring. "Look at the tip finish - that will tell you a lot,' says Jeanette Lee. You also can check out your tip's track marks on the cloth.